The representatives of all factions and groups receive letters. The members the charity foundation Come Back Alive turned to the 50 people's deputies with a proposal to spare a part of their estate they have shown in their electronic declarations in support of the army. The Fund said on Facebook on 13 March that the letters with donation requests are part of the "E-tithing" initiative and will be sent to representatives of all factions and parliamentary groups. "This time we decided not to become attached to caucuses, dates, wealth or other criteria. We selected new recipients in alphabetical order. The request letters based on this principle will be prepared and sent next week, "the Fund says. Volunteers plan to reach out to every people's deputy. The results of request will be made available online. 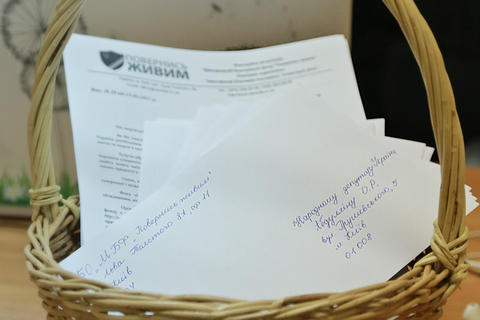 At the first stage of the campaign that lasted from November 2016 to February 2017, volunteers sent 55 letters to wealthy ministers, deputies, heads of city and regional administrations, prosecutors and judges, as well as ten lawmakers who were Maidan activists.